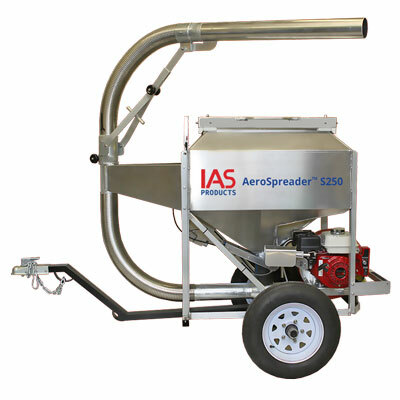 IAS Products offers a compact trailer assembly to adapt any stationary AeroSpreader™ S125, S250, S500, or S1000 model Dry Pellet Feed Broadcaster for easy towing by an ATV, tractor or pick-up truck. Ideal for raceway or pond feeding requirements requiring high mobility for optimum feed delivery and spread. This trailer configuration is ideal where the tow vehicle serves many other farm duties. The well balanced trailer hitch makes connection quick and simple, providing for easy one-man farm operation. Trailer packages include all required bolt on assemblies to include a steel tube axle with 4 or 5 bolt hubs and matching steel wheels, pneumatic tires, a heavy walled aluminum tow bar, and choice of 1- 7/8 inch or 2-inch ball size hitch. A heavy safety chain, chain shackle, and rear corner safety reflectors complete the package. Complimentary options include Manual Periscope Feed Head, Wireless Control, and Feed Gate Indicator. Feeder frame mounted axle and tow bar hitch components are easily assembled to change any stationary AeroSpreader into a versatile mobile feeder. 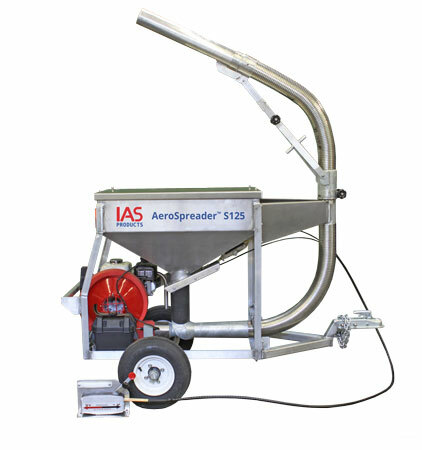 Turns an AeroSpreader™ Dry Pellet Feed Broadcaster into a mobile feed delivery platform for better feed broadcast coverage and spread. Reduces feed competition, feeding stress and improves feed conversion rates. Improve farm equipment utilization. A well balanced trailer hitch allows for one man connection to any suitable ATV, tractor or pickup. Quickly disconnected when not required freeing up tow vehicle for other farm duties.